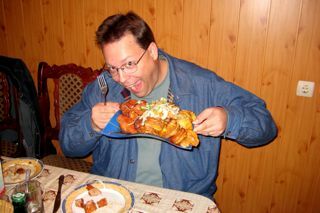 Blogging Bookwalter» Blog Archive » The Kremlin tries to poison American tourist with food! The Kremlin tries to poison American tourist with food! The next day, I was pretty much down for the count, but thankfully recovered the following day enough to drive our rental car 5 hours back to Kakhovka in order to return it on time. And that was an adventure unto itself, renting a car in a foreign country and driving the bumpy two-lane highway trying to keep up with our Ukrainian friends in the car ahead. And this was after the airline losing our luggage for 4 days the first week! Anyway, the trip wasn’t all bad… we spent a lot of quality time with the wife’s family and I finally got to meet my 2-year-old niece & nephew, who were born just prior to the wife coming to America. It’s a long trip and after 2 1/2 weeks, I’m happy to be back home, where we’re preparing for our own new arrival in February while I make some changes to my business in the months ahead. Stay tuned! This entry was posted on Friday, September 19th, 2008 at 9:43 pm	and is filed under Family, Random Thoughts, Travel. You can follow any responses to this entry through the RSS 2.0 feed. Both comments and pings are currently closed.